Hey El Cajon, looking for a storage unit? Give Big Box Storage a try! Hello BBS’ers! We thought that would be a fun nickname for fans of our business. Big Box Storagers….then again, not everything needs a nickname. This week we are once again focused on the jewel of East County San Diego: El Cajon and all your storage needs. El Cajon is the 5th largest city in San Diego County. El Cajon is also the home of NASCAR driver Jimmie Johnson. We wanted to point out a fun event coming up as well. 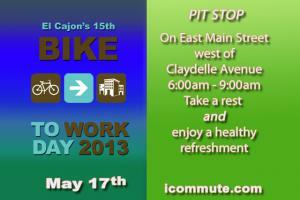 May 17th is Bike to Work Day in El Cajon and from 6-9am there will be a pit stop on East Main Street west of Claydelle Avenue. What a great idea. If we didn’t have to drive the Big Box Storage trucks around El Cajon and the rest of San Diego County we would definitely bike to work. Also, a quick note for students attending San Diego State University, Cal State San Marcos, University of San Diego, University of California at San Diego, Point Loma Nazarene or any of the local colleges in San Diego: Big Box Storage is YOUR home for all your storage needs during the Summer months when you return home from school. If you have to leave the dorms, don’t leave your stuff. Call Big Box Storage today at 800-391-4890. If you sign up for 3 months we have a special where we waive the delivery fee of $99. That’s perfect for students. With Summer fast approaching, start storing your items now and get a jump on your move out of the dorms. The beauty of it is, when you come back to school in the Fall all your valuables will still be here in San Diego waiting for you. Good luck on Finals!